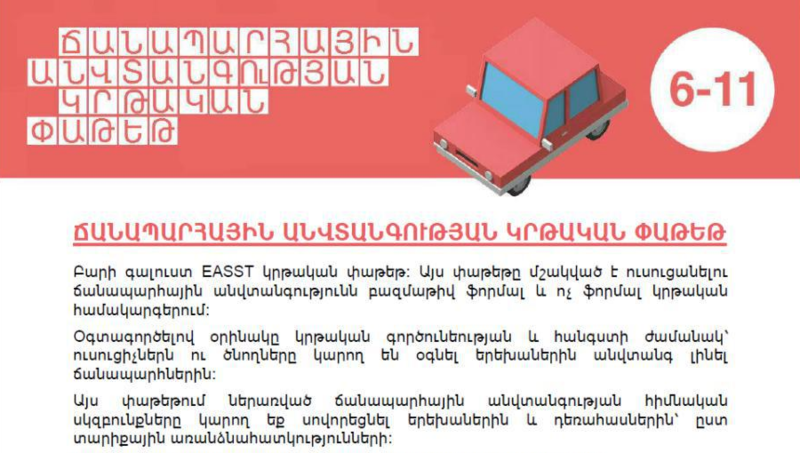 Our main partner Eastern Alliance for Safe and Sustainable Transport elaborated EASST Road Safety Education Pack, which is a global teaching resource that provides stimulating and engaging activities to introduce road safety messages and behaviours to kids. 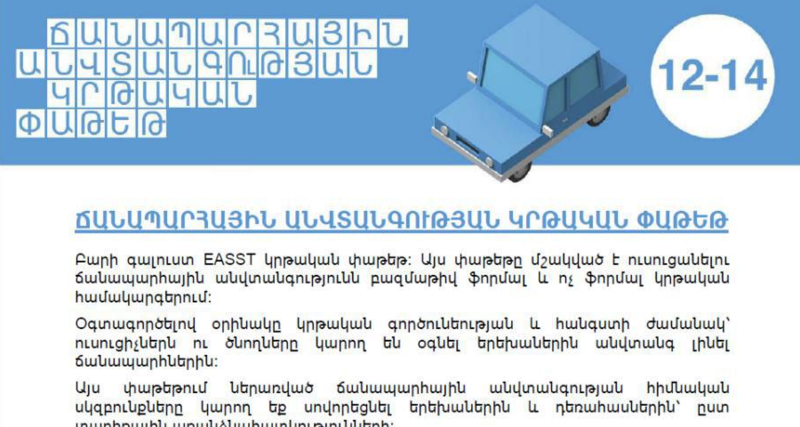 To date, thousands of children across the world, including Armenian children, have been taught using the Pack and EASST has heard great reports of children reminding their parents to fasten their seat belts and not use their mobile phones while driving as a result of the lessons. The pack has been developed in co-operation with our EASST Partners as well as highly experienced UK road safety experts including the UK Government’s Think! Campaign. It has been tailored to reflect the risks, challenges, and conditions in low and middle-income countries. NRSC has translated the packs and tested them in several schools. Split into three sections targeted at under 6s, 6-11-year-olds, and 12-14-year-olds, the pack provides the resources you need to teach children and young people basic road safety principles in an age-appropriate way by using simple, fun, educational activities. — Awareness of traffic and its dangers. — Good behaviour around roads. — Making safe choices to keep you and others safe. The topics in each section vary according to the target age group, but they all relate to our key principles, helping teach road safety in a variety of formal and informal educational settings.